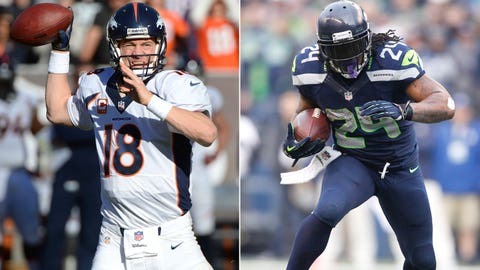 Peyton Manning (5,477 yards passing, 55 TDs) and Marshawn Lynch (1,573 total yards, 14 TDs) are viable bets for three games apiece during the NFL playoffs. You never get a second chance to make a first impression … unless we’re talking about fantasy football. In this realm, sweet redemption comes in the form of dominating the NFL postseason league of your choice. Before you blindly accept the scoring rules, terms of competition and entry fees of any random league, though, allow me to break down the fundamental and strategic differences of standard postseason (or "longevity") leagues and weekly one-and-done (or "survivor") leagues. Case in point: Seven years ago, prior to the Wild Card round, I correctly pegged the Colts and Bears for the Super Bowl and subsequently loaded up on stars like Reggie Wayne, Peyton Manning, Joseph Addai and Chicago’s Thomas Jones and WR Bernard Berrian (18 TDs from 2006-08). All told, the quintet produced 18 combined playoff games on — easily enough to provide yours truly with a welcomed fantasy crown. At the risk of sounding like a broken record from the regular season, weather should always play a role in starting picks. All things being equal, I’d rather have a QB performing in a warm, comfy dome over one struggling in the wind, cold, rain and snow. But with the exception of Indianapolis (dome) and maybe Carolina (Charlotte), there aren’t any other guarantees of ieeal-weather outings throughout the playoffs. If you believe Manning and Russell Wilson will be the starting QBs on the first Sunday in February, it’s imperative to keep one of ’em on the sidelines during the AFC/NFC playoffs.